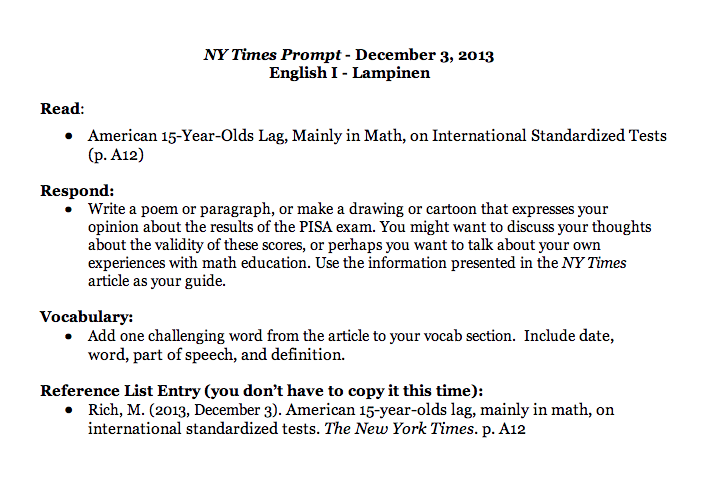 Yesterday I had my freshmen read the article “American 15-Year-Olds Lag, Mainly in Math, on International Standardized Tests” in The New York Times. I gave them an intentionally vague prompt to elicit their response about the article (see prompt below). I have to say, I was impressed by their responses. Many students addressed the issues with reliability of the scores. They even did the math and found that 6,100 15-year-olds represent less than 1% of the entire population of 15-year-olds in the United States. They argued that this is too small a sample size, and they even noted that the US is so diverse that there is no way that such a small sample can possibly be representative of all students in America. I may be biased, but I am quite proud of the ways in which my students stopped and thought critically about the validity of a test that so many adults seem to take at face value. The real reason I’m writing is to share one student’s response to the article. In just 43 lines, this 13-year-old freshman offers real insight on some pretty big ideas. She asks, “How can my end / be defined by a moment?” I wish I could have said it so well. Without further ado, here is Sim T’s poem! Mixing together in my head. And my foot begins to tap. For this… is your future. Be defined by a moment? Aren’t I more then just that? Just a number on a screen? Everything that makes me me? To fill out this paper. Stare at me from the pages. ← On how the Internet reaffirmed my faith in humanity.